Home Tags Posts tagged with "Dice Kayek"
Does it look like late October to you? It was so warm in the sun, even if a little windy. The pictures were taken on Saturday, when it was still about 20 ºC in Valencia, but today it went down 10 ºC. I have to start on my winter coat! 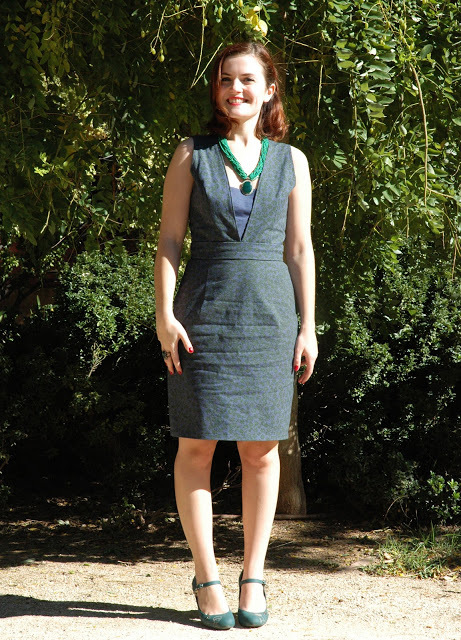 This little number is the designer pattern from Burda magazine July 2011 issue. It is from the turkish brand Dice Kayek and you may not recognise it as it originally came with a double peplum. Other than omitting the peplum, I didn’t change anything from the pattern. It fits quite well, the overtop design is interesting and the general shape is flattering. This is quite a classical pattern but I am very newly drawn to it. I am normally more into flared and very full skirts, but this is a nice change, it makes me feel more mature. And I have to admit, to me, it screams Joan Holloway (the redhead secretary from Mad Men, in case you are wondering). I used a medium weight cotton that I dyed in my washing machine. It was beige with yellow flowers and I must have liked it when I bought it last year, but as I still had not used it, I decided to give a go at the indigo dye I had and see if I would like it better that way. And it was a good thing to do as I like the new colour a lot. I lined the skirt portion so it will be ok to wear it over tights this winter. On a different matter, there is a new club in Valencia and I am so excited to have the first meeting on Saturday: Club Handmade Valencia. I’ll tell you more about it after the inauguration. But if you are in Valencia, come!